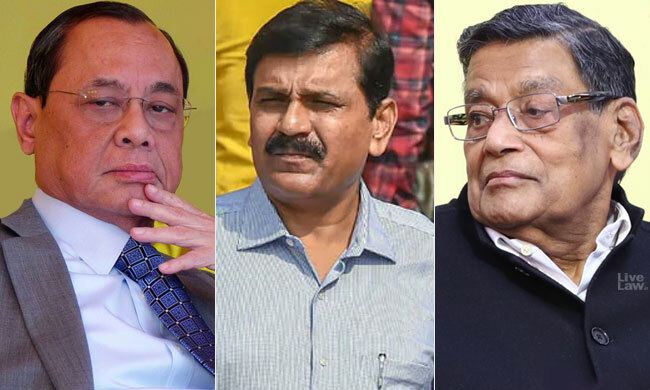 The Supreme Court bench headed by CJI Ranjan Gogoi today held CBI Additional Director M Nageswara Rao guilty of contempt of court for transferring the investigating officer heading the probe in Muzaffarpur shelter home case in violation of the orders of the Court. The Court sentenced him till the rising of the Court and imposed a fine of Rs. one lakh, after noting that the transfer orders were passed by him despite knowing that the SC had ordered that the investigation team should not be changed. S Bhasu Ram, in-charge Director of Prosecution CBI, who offered legal advise regarding the transfer orders, was also held guilty of contempt and was awarded the same punishment as given to Rao. Attorney General K K Venugopal, appearing for Rao, made a fervent plea for leniency, saying that Rao's mistake was not willful. At the outset, the CJI asked the AG why a contemnor was being defended at the Court's expense. The CJI said that Rao's action was 'brazen contempt' and that he deserved no leniency. "Would the heavens have fallen if the relieving orders were passed after taking the SC into confidence", CJI asked the AG, commenting on the orders passed by Rao in his capacity as interim chief of CBI. "I have not invoked contempt powers and punished anyone in the last 20 years. But this is brazen", CJI Gogoi said, deeply aghast at the Rao's action. When the AG submitted that action against him will destroy his career record, the CJI remarked "Even if we accept his apology, his careeer record will remain blemished, as he has admitted of committing contempt". Yesterday, Rao had filed an affidavit, stating that the transfer order was issued by mistake and offered uncoditional and unqualified apology. However, it did not persuade the Court from dropping action against him. On February 7 the bench came down heavily on CBI for transferring its former Joint Director A K Sharma, who was probing Bihar's shelter home cases, out of the agency in violation of the court's order and directed its then interim chief M Nageswara Rao to personally appear before it on February 12. A bench headed by Chief Justice Ranjan Gogoi took serious note of violation of two earlier orders of the apex court and issued contempt notice to Rao for transferring Sharma to the CRPF on January 17 without taking prior permission from the court. The bench, which also comprised Justices Deepak Gupta and Sanjiv Khanna, directed CBI Director Rishi Kumar Shukla to give the names of officers who were part of the process in transferring Sharma out of the probe agency. The top court referred to its earlier orders in which it had asked CBI not to remove Sharma from the team probing Bihar shelter home cases. Rao had filed an affidavit admitting that he committed "mistake" in transferring former joint director A K Sharma and apologised to the Supreme Court saying he had no intention to circumvent its orders. In the affidavit, he offered unconditional and unqualified apology to the apex court. "I sincerely realise my mistake and while tendering my unqualified and unconditional apology, I specially state I have not wilfully violated the order of this court as I cannot even dream of violating or circumventing order of this court," he affirmed in the affidavit. Besides Rao, the bench also sought appearance of all other CBI officers who were involved in the transfer process of Sharma on February 12. It also directed for presence of S Bhasu Ram, in-charge Director of Prosecution CBI, for violating its order. Several girls were allegedly raped and sexually abused at an NGO-run shelter home in Muzaffarpur and the issue had come to light following a report by the Tata Institute of Social Sciences (TISS).